Habits we acquire happen over a period of time. They typically begin with a cue and a perceived positive reinforcement of a reward. Maybe we bypass going to the fitness center or take a bike ride because it is more pleasant to sit on the couch and watch Netflix. It’s just too convenient to press the TV remote (cue) and then become engrossed in countless shows that are entertaining, educational – or both (reward). Doing this too often may develop into a new habit that could detract from a previous habit (e.g. gym or bike). We exchange one habit (exercising) for another, less-healthy habit (TV binge-watching). According to a recent Centers for Disease Control and Prevention report, 36.6 percent of Americans eat some kind of fast food* each day, with men being a bit less discerning about what they eat (37.9 percent) than women (35.4 percent). When you think about it, fast food is always accessible throughout the day, making it just too convenient for many of us to pass up. On a typical day, almost 23 percent of Americans will eat breakfast from a fast-food outlet, while about 44 percent of us will pick up a ‘quick’ meal during lunch. Not to be left out, fast-food dinners draw another 42 percent of Americans. Ethnic group and age also provide differences when it comes to the daily consumption of fast food. Higher income equates to more fast food: The more money we have or make, the more likely we are to eat fast food on any given day. For example, about 32 percent of people who earn less than 130 percent of the federal poverty level eat fast food daily. 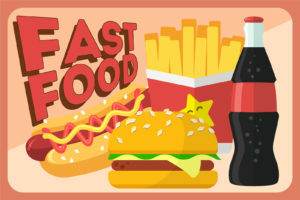 However, over 36 percent of middle-income families (earn between 130 – 350 percent) purchase fast food daily, while 42 percent of people with incomes above 350 percent consume fast food daily. This finding is interesting because healthier food can cost a bit more than fast food, and yet, regardless of having the ability to pay for more expensive, healthier food, we often elect the more convenient food that is available at our finger tips (often using the drive through). Additionally, with our younger population consuming more fast food compared to older generations, younger families (and their children) will be more likely to establish unhealthy eating habits – creating health issues later in life (obesity, heart disease, dementia, etc.). The intake of calories, fat, and sodium eventually adversely affects our health in many different ways. Another report recently released by The National Survey of Children’s Health compares the obesity rates of children (ages 10 to 17) for all 50 states. Almost 18 percent of our youth in Iowa are obese, ranking our state as the 10th highest state for youth obesity. Iowa’s white (non-Hispanic) youth are significantly higher than the national rate. The implications of having overweight and/or obese youth present future challenges to our state. For one, employers desire to have healthy and productive employees in their workplaces, and having unhealthy employees will continue to leverage up their health insurance costs due to higher healthcare usage. No one wants a poor quality of life, but often this is a result of the choices and habits that have been established much earlier in our lives. Per a recent Harvard T.H. Chan School of Public Health report, we are still trying to come to terms with the dietary fat we consume – fat that is good and fat that is bad. This much we know. Establishing a habit based on mere convenience may not be the smart choice we should make for ourselves, individually – or as a society. To stay abreast of employee benefits and healthcare issues, we invite you to subscribe to our blog. *NOTE: For this survey, fast food was broadly defined as any item obtained from a “fast food/pizza” establishment. It is possible that some people may interpret fast food differently from one another – e.g. takeout sushi, etc.